One needs to be M.A.D. After three decades of absence, I had the opportunity to design speakers over the last few years for a lighting company in Australia. Through that process, I rediscovered my passion for it and embarked on a path of upgrade for the original Microphase SATs introduced in 1984 in Paris at the Salon de la Haute Fidélité run by Jean-Marie Hubert. I started by investigating a new tweeter. As good as the original TW10 from Audax was, the research done over 30 years in that department, driven by the need for higher quality sound in cars and television sets in a small package meant that there was now a plethora of tweeters in the same size as the TW10. I experimented with many from VIFA to Morel and many more, but finally settled for a 1" VIFA soft dome, for it silky sound, as well its matching efficiency and extended frequency range, way beyond the traditional 20 kHz. Being flangeless, I had my cabinetmaker designing a 3mm MDF flange the exact same size and shape as the Audax tweeter. You can see it on the original SAT in the photo above. I also decided to sell that here as an upgrade kit for people who may still have the original speakers. The beauty of it is that it didn't required any changes in the crossover, so it is really a case of swapping the two drivers with two solders and Bob's your uncle, you are in business and in for a treat! What this upgrade does is illuminating the treble frequencies between 4 and 8 kHz, refining the sound with an amazing new level of details and power handling capacity that the 10 franc TW10 could only dream of! The new VIFA costs 10 times more but it is an investment well worth the money. We on sell it with flange all ready to install, freight included anywhere in the world for USD 100 each. See our e-store for more details to order them. Having made some money with a big lighting project using my newly designed micro speakers (I might tell you this story another day...), I decided to reinvest some of that profit into a brand new satellite system and baptised it as SAT MK2. For a number of reasons, I also decided to change the name of the brand to more explicit and modern version. We will soon unveil a new logo (It is already designed as a sketch, I just need to make it into a professional logo now. ​I ordered two carbon units from Madisound in the US, but it was lacking the finesse of the paper cone and I was not entirely satisfied with the result. The result was immediately amazing and actually an improvement on the original driver. The integration with the VIFA tweeter was exceptionally good, once the crossover was fine tuned. The power handling is significantly improved as well and the speaker sound much bigger than it is actually. In the next episode of the story of the genesis of these new beauties, I will talk about the cabinet and our newly found cabinetmaker extraordinaire as well how we managed to extract more bass out this tiny box. Stay tuned! They say that necessity is the mother of all inventions... I also believe in serendipity! So I started to ask around and one of my components supplier, WES Alliance, pointed me towards somebody a good 90mns south west of Sydney, not my regular patch, to be honest... But, I made contact, got an appointment and met Graham! He is such a real Aussie bloke, with a second business and main source of income in 4WD accessories and a fabulous pedigree when it comes to making speaker cabinets and assembling the whole thing for people as famous as Legend (founded by an ex technical director of Linn, no less...) defunct Orpheus when my friend Brad Serhan was the designer and many more famous Australian brands. We understood each other immediately, without CAD drawings, or any fancy modern tools, although his factory is equipped with a number of up to date CNC machines, routers and the likes. What I discovered with our first prototypes was that he was also very good at the clear polyurethane finish that Jean-Paul was so good at... We were in business! From the photo above, you can gather that we have stayed faithful to our design look with marine birch plywood with its exposed structure, a key design element. However, I wanted to refresh and modernise the look (after all we are now in the 21st century... and the iPhone is almost 10 years old!). On a previous commercial design, I had played with recessing the tweeter behind a little horn and found it both attractive as a look but also providing a slight lift in efficiency to match the very efficient main driver. This little wonder doesn't take any space inside the cabinet and still goes fairly low, so it is quite perfect and fits (just...) on the back panel, which we had to accept as being removable and still be airtight, as the two drivers will act as one push pull unit. You will also note that we have taken the decision to go for bi-wiring from the start, with a future active version in mind. Our previous model was very popular with recording studios and radio stations (we equipped the National Norwegian Radio studios at the time, not a mince feast!). Our German distributor was also a fan for domestic use. The next step was to make sure the push pull was working properly physically and then acoustically. To that effect, we started by keeping the back driver as a passive radiator and making sure that pushing in one of the driver was actually resulting in the other one moving out. It is a tribute to Graham, our cabinet maker, that after only minor adjustments, the cabinet was perfectly air tight and looking like one closed box. Then we starting listening and taking some measurements (more on that later...) adjusting the simple Linkwitz-Riley crossover between the midrange and the tweeter, and the stuffing of the cabinet. Too much wool and the piston effect would be reduced to almost nothing, too little and the bass driver would not be damped properly. Then, we connected the bass driver as a full range driver (no crossover at all...). The level of bass was very satisfying, but there was too much midrange leakage from the back, so we had to start installing a crossover. We started with a 12dB/oct, but this was still not steep enough, so we ended up with a 24dB/oct, what we normally use in a proper subwoofer. But there is no much space in this cabinet... See how it looks in our prototype below. Before we talk about listening sessions and measurement techniques and results, let me just mention that after a few trials, it became evident that the 19mm tweeter was actually not as good as the 25mm we had used to upgrade the original SATs. So, although it is a lot more difficult to mount, being flangeless, it was night and day to my ears, and it is here to stay. The components employed, drivers and crossover alike, are all expensive products. The complexity of the cabinet making process and the high level of finish mean that our cost of manufacturing is quite high, hence the competitive but rather high price shown on our e-store page. Also, this is an exclusive product which will be made in a limited edition of 100 pairs only all numbered, plus six demo pairs, one for us, bien sûr, and one for each of the five lucky showrooms around the World where you will be able to listen to these beauties soon. Two of these showrooms have been identified, one in Australia and one in France. We expect them to be signed up and equipped towards the beginning of December 2016....Stay tuned! This page will eventually be part of a dedicated website soon to be launched, and future additions to the range include an active subwoofer, a central channel, and two rear channels, so you have a full Microphase Audio Design home theatre set up! The active subwoofer will be available early December 2016. 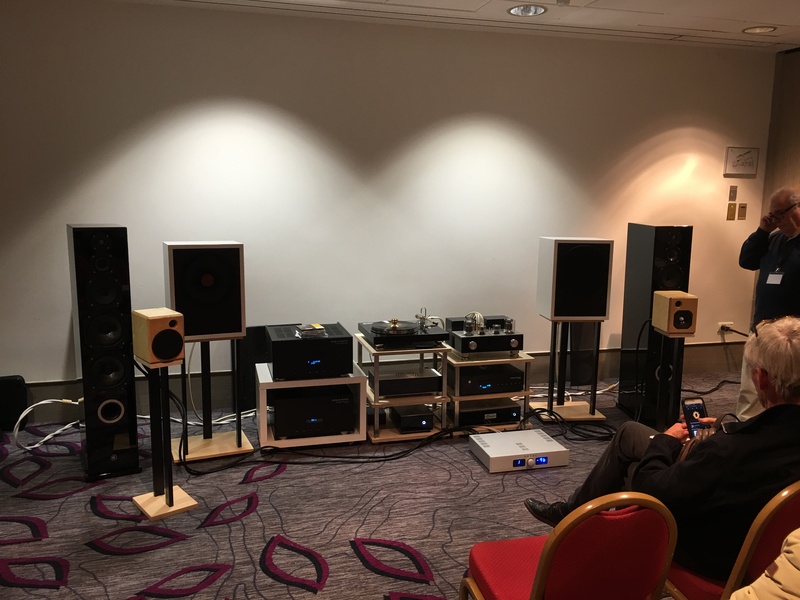 The central channel and rear channels should available next year in time for the Munich High End Show, where we might exhibit with a partner, but not being there ourselves, as I have some family commitment at the same time. An active version of the SATs MK2 are planned sometime in 2018, probably for SMPTE. Final cabinets have been received, wired, tested, measured and listened to. 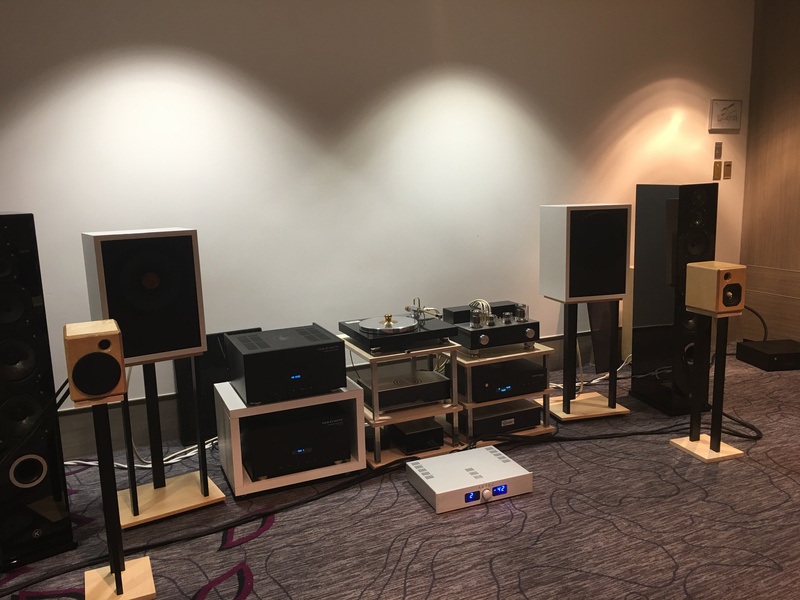 They are off to Paris for the Salon de la Hifi on November 26th and 27th at the Marriott Rive Gauche on the stand of Point Musiques. Come and have a listen! The show attracted about 3000 visitors and we had about 500 of them stopping by each day! Not a mince feat! Jean-Jacques is an encyclopedia of music and recordings (he has 40 versions of the Four Seasons in his collection of over 4000 CDs and even more vinyls) and his demos are second to none. His choice of music was wide and eclectic and were chosen to emphasise the quality of each system presented. And the result for us was that even in 55m2 room full of people (and that's a lot of absorbant material...) we were playing as well as the other systems, but for the lower octave of the material presented. And we were up against some very big and very good systems, as you can see! We are open for business! Visit our new website for latest specifications and ordering procedure! See you on the other side!